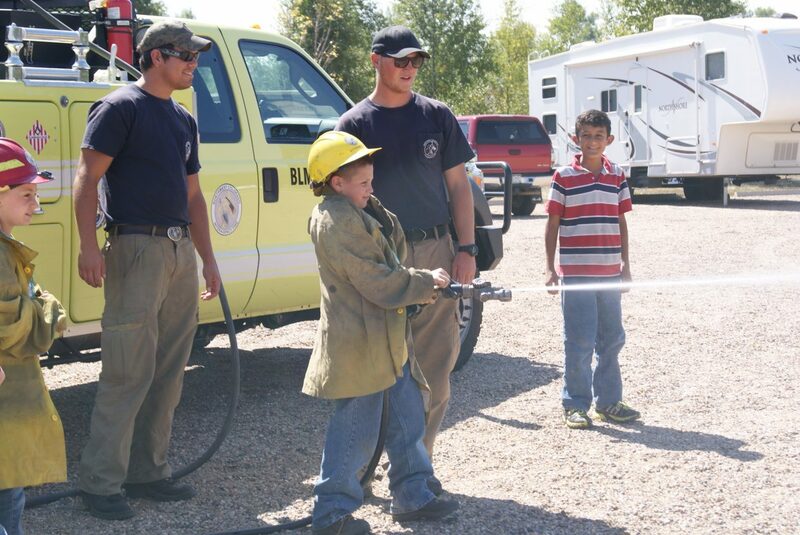 Connor Winn, of Sunset Elementary, takes his turn to spray the hose, as firefighters Hawk Fick, left, and Alex Farinetti of the Craig Bureau of Land Management look on. Fifth graders from Sunset and East Elementary schools took part in an overnight outdoor education experience Thursday and Friday at Yampa River State Park. — Stacy Ponikvar, a teacher at East Elementary School, about an overnight field trip for fifth-graders at East and Sunset elementary schools to Yampa River State Park. Fifth graders of Sunset and East Elementary in Craig spent Thursday and Friday roughing it at Yampa River State Park. An outdoor education experience, the overnight field trip had students spending two days rotating through seven stations learning about the outdoors. Stacy Ponikvar, a teacher at East Elementary, said the field trip meets state science and social study components. With seven stations, including archaeology, animal tracks, geology and wildfire management, students were provided hands-on activities at every station. Students pressed flowers, handled rocks and fossils, threw a spear (without the spear head), panned for gold and sprayed the hose from the wildfire truck at a lit flare on the ground. It’s a lot of work, and a lot of teacher’s time,” Parrot said. She said the trip wouldn’t be possible without the help and time spent volunteered by the Bureau of Land Management, the Forrest Service and the State Park, along with parent volunteers. Parrott also said she hopes the experience opens doors and gets students thinking about futures they may not have before, such as archaeology and fighting wildfires. “I hope this trip teaches them to respect the outdoors,” Parrot said. Jessica Porter, a fifth grader from Sunset elementary, said her favorite part Thursday was spraying the fire hose. “It was heavy,” Porter giggled. Stephanie Murr, a teacher at Sunset Elementary, said the field trip was a good opportunity for students of the two schools to mix and meet new people before heading off to middle school together next year. Thursday night, students would see a presentation on a sloppy hiker who leaves trash and is irresponsible and the ranger who sets her straight, a lesson in astronomy, a barbecue, and watercolor painting. “We hope it’s a lifelong experience,” Parrott said.